This is the fastest and expanded PRO free web hosting you have ever seen. Security and stability - is what 1freehosting.com company thinks first. Check our uptime statistics. We offer free web hosting that others try to sell! All our services are free and without any ads! First Free Hosting company offers same complete features that others sells commercially. Don’t have a website? Built it now quick, easy and FREE! 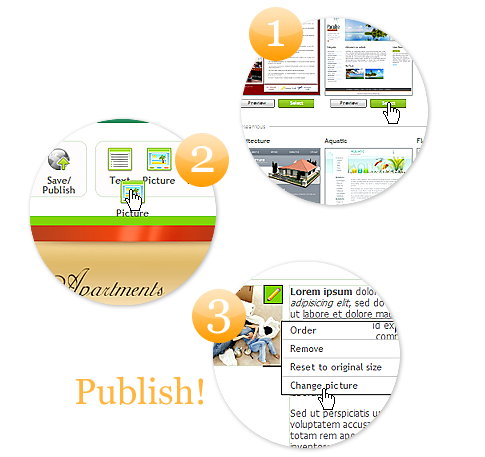 Build and publish your website with an Easiest Site Builder tool. Create websites easy and free with 1FreeHosting.com revolutionary website builder and most beautiful free website template design collections. Forget about design skills, coding or other technical knowledge, with our Drag and Drop system you may build amazing web sites like a real PRO. Free hosting Easy website builder is intuitive and powerful tool that even newbie or advanced users loves! Stop paying designers or coders, just start free website building software and create beautiful websites yourself in just minutes. Want to start e-shop, commercial website, blog or just nice web portfolio? Free hosting website builder can handle all these and it costs nothing. All of 1FreeHosting tools and web hosting features are free forever and to everyone! With our latest free hosting Cpanel you'll be able to configure and manage your websites without web hosting administration knowledge. Just login and get inside free hosting Cpanel and SSH area, that makes every webmasters life easy. Set all your DNS, Emails, PHP, Mysql, SSH and FTP accounts just in few clicks via simple free web hosting Cpanel area.